Astronomers have discovered a new super-Earth in the habitable zone, where liquid water and a stable atmosphere could reside, around the nearby star HD 40307. HD 40307 is an orange (K-type) main sequence star located approximately 42 light-years away in the constellation of Pictor (the Easel). It is calculated to be slightly less massive than the Sun with six known planets orbiting it. In 2008, three extrasolar planets were discovered in orbit around the star –found to be hot super-Earths because they orbit too close to the star to support life. 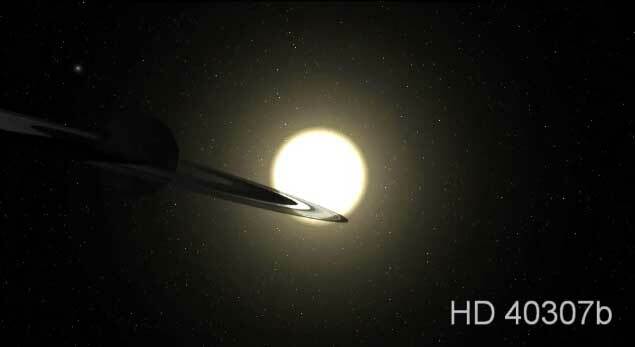 In 2012, three more planets were discovered orbiting HD 40307. One of them, HD 40307 g is a Super-Earth with orbital period about 200 days, and might be capable of supporting liquid water. The three planets were found by an international team, including Carnegie co-author Paul Butler, led by Mikko Tuomi of the University of Hertfordshire and Guillem Anglada-Escudé of the University of Göttingen who used newly developed software that is able to process the signals more thoroughly, re-analyzing spectra detected by the radial velocity method, using the HARPS spectrograph system through the European Southern Observatory. "With Guillem Anglada-Escudé's new velocity reduction package," said Butler, "we are able to extract more information from the HARPS spectra, and thus make a more precise measurement. This coupled with the innovative Bayesian orbital searching algorithm, primarily written by Mikko Tuomi, allows us to search deeper into the data and to find smaller Earth-sized planets around the nearest stars. This, of course, increases our chances of finding more in that orbital sweet spot that we call the habitable zone—the zone where it is not too cold, nor too hot for liquid water to exist." The most interesting of the new planets is in the outermost orbit from the star, a distance that is similar to the distance between the Earth and our Sun. Its mass is at least seven times the mass of the Earth. The team said the planet is likely to be rotating on its axis while in orbit, possibly creating a day/night cycle and an Earth-like environment. "The star HD 40307 is a perfectly quiet old dwarf star, so there is no reason why such a planet could not sustain an Earth-like climate," said Anglada-Escudé. The research will be published in Astronomy & Astrophysics and posted online at arxiv.org/archive/astro-ph.